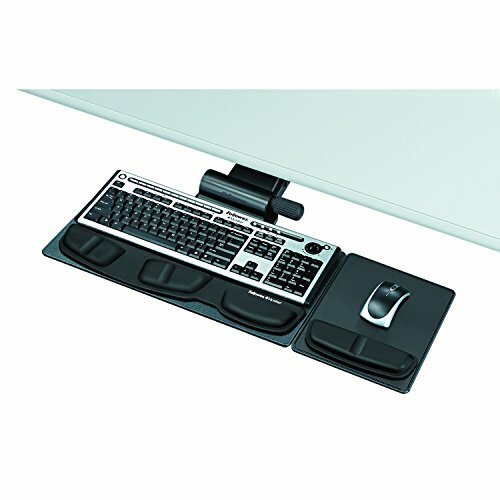 Fellowes Professional Series Premier Keyboard Tray with Comfort-Lift system lets you slide mouse platform left or right over keyboard numeric pad and offers 2 custom height positions. Designed and manufactured for Fellowes by Humanscale. Mouse platform tilts forward or backward, adjusts up or down, and mounts on left or right side of keyboard tray. Warning Trak helps prevent mouse from sliding off platform. Lift and lock feature lets you adjust height with one hand. Single manual knob adjusts tilt up to -10 degrees for optimal comfort. Health-V memory foam supports with Microban antimicrobial protection stay cleaner and relieve wrist pressure to help prevent carpal tunnel syndrome. Durable platforms withstand daily use and feature non-skid pads. Slim profile fits standard workstations.